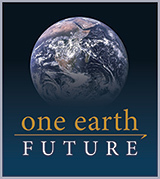 Maisie Pigeon is Project Manager for One Earth Future’s (OEF) Stable Seas program. She joined OEF in 2011 as part of its Oceans Beyond Piracy (OBP) program. During her tenure with OBP, she led the program's State of Maritime Piracy report series from 2016 to 2018 and conducted research and analyses on other maritime security issues. Prior to joining OEF, Maisie lived in Washington, D.C., where she developed and implemented several social advocacy campaigns and strategic communications plans for NGOs focused on global health and international development. She has her MA in International Studies from the Josef Korbel School of International Studies at the University of Denver and she received her BA from James Madison University, where she studied political science, anthropology, and African studies.